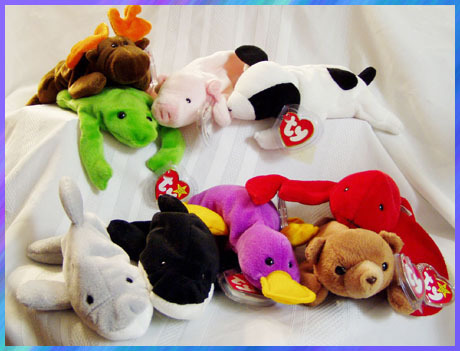 The first Beanie Babies were introduced to the world in late 1993 at the World Toy Fair in New York City, these first nine would become known as the "Original Nine." These beanies were a new style plush all together, instead of the typical stuffing that accompanied most plush toys these had a combination of 'beans' and stuffing. The 'beans' or small plastic PVC pellets gave these plush a new uniqueness. You could now make your animal sit up in various posable positions. The critics were skeptical, some even nicknamed them, "Road Kill," due to being under-stuffed and filled with beans. Each of these new creations were accompanied by a hang tag, that unlike today's locket style tags, it consisted of what is today called a 1st, generation hang tag. It was a single double-sided Ty tag with a smaller Ty on the front and the animal's name and style number on the back. Poems had not yet been introduced. They also had a white sewn-in 'tush' tag with black lettering. Most of these original beanies had their tags removed, as was recommend by toy manufactures, when giving the toy to small children. At the time they were not thought of as collectors items. (Yes they were actually given to children to play with!) So beanies with these tags are rare and valuable today. So who were these 'Original Nine' beanies? Who were these first beanies to cause a mad craze worldwide? Who were these first beanies that caused hundreds of crazed fans to stalk mail carriers, stand in line for hours before sunrise, counterfeit beanies for profit, and start a whole new breed of avid collectors? Who were these under-stuffed plush toys that would lead to the building of "an empire based on inexpensive toys filled with plastic pellets?" Lets welcome, Legs the Frog, Squealer the Pig, Brownie the Bear ( later renamed to Cubbie the Bear), Flash the Dolphin, Splash the Whale, Patti the Platypus, Chocolate the Moose, Spot the Dog and Pinchers the Lobster! These beanies first appeared in small gift stores in the Chicago, Illinois area in January 1994. They would be the first to mark Ty, Inc. as a company of quality and reasonably priced stuffed toys. Although, when these "bean filled" toys were first released they did not initially catch on, it didn't take long before they did, and when they did the results were phenomenal! They became an instant hit primarily in 1996 after Ty retired 11 beanies! They were cute, small, affordable and well we will never really understand what made them a phenomenon when compared to other plush toys! Sadly, today none of the Original 9 Beanies are current, they have all since long retired. 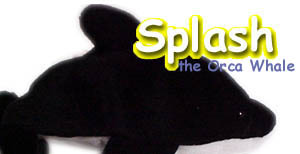 Splash and Flash were retired in May of 1997, Legs and Spot followed suit and retired in October of 1997. During 1998 the last 5 of the Original 9 retired, Cubbie retired in January and Patti, Pinchers, and Squealer in May, followed by Chocolate in December. Of course the first release of these Beanies had no poems, it was not until Chocolate was released with 4th generation tags did we see a poem. Chocolate was born April 27, 1993, he is a dark brown moose whose favorite treat must be chocolate! Poor Cubbie! Yuck broccoli! Cubbie is probably remembered most for being given away to children at Chicago Cubs games. The first giveaway was May 18, 1997. The first 10,000 children at these games received Cubbie accompanied by a commemorative card noting the special event. These first Cubs giveaways sell for $100+ on the auctions today. Oh! You want to know more about the Brownie v. Cubbie thing! Well Ty first released Cubbie under the name of Brownie, Brownie is very rare and retired shortly after release in 1993. These two bears are identical with the exception of their tags! Brownie along with Punchers (known today as Pinchers) were truly the first beanies, as they were released in early 1993. The whole set of "Original Nine" were officially released at the New York Toy Show later on. Flash and Splash were both retired together on May 11, 1997. They seem to make a great pair as Splash the Teacher and Flash the Student. Flash was born on May 13, 1993 and after retirement replaced by Echo the dolphin. Legs will be the new friend you make! Legs was born April 25, 1993 and seemed to be one of the first beanies to somewhat flood the market, there were plenty to go around! Legs retired in October of 1997. That would explain her extra large beak! Patti was born January 6, 1993 and is one of the first beanies to be a part of Ty's crazy world of changing colors! The purple platypus has been magenta, maroon and raspberry! An original Patti still fetches a lot of money on today's market. Moving forward slow as a snail. Pinchers is a bright red lobster. Pinchers was originally released with tags that said "Punchers," most likely a spelling error. Splash was born on July 8, 1993 and was one of the first to be retired. Splash is a pretty hard to find beanie today. There is no doubt he will make you smile! This pink little Squealer was born April 23, 1993. Squealer was one of the Original 9 in production the longest, not retiring until 1998.